Essie nails in "Smokin' Hot"
Some days, you just don't want to fuss over an outfit. You still want to look put-together, but you don't want to put the effort in. Hey, we've all been there right? As much as I love styling my clothes and dressing myself using pretty accessories, I do have "off duty" days where a sweater and comfortable jeans is all I need to run out the door. I'm so happy I found this pullover at Macy's last week. It's soft as can be, and the faux lace detail around the neckline adds that feminine touch I gravitate towards. After SOMEONE I know accidentally stuck a similar pullover in the dryer a few months ago, I had been wanting to replace it. That one was torn to shreds, so I tossed it. I love him to death, but he will never touch my laundry again. Ooh, I think you would look great with a longer bob. And you have the thickness and shine to your hair that looks so great with that cut. When I first saw this sweatshirt on IG I thought it was the other one...but sounds like that one is RIP! Uh oh! Well, this one's just as cute and looks comftorable and polished! Oh no! I would be so mad/sad if my top got shrunk! At least he tried :) And at least you were able to find a cute replacement! I've been loving the longer bob style too! Amen to off days.This sweatshirt looks like the perfect thing because it gives the comfort of an off day but not the look. I love Sincerely Jules hair. If mine were a little thicker, I would totally grow it out a bit. You'd look great with it but then I love it now. Love this sweatshirt, it looks comfy and is still very pretty. I love the idea of a long bob and I hope make I'm aiming for that as well. Jules hair is adorable. Oh no! Sorry about the death of the lace pull over. So happy you found lace pull over II. 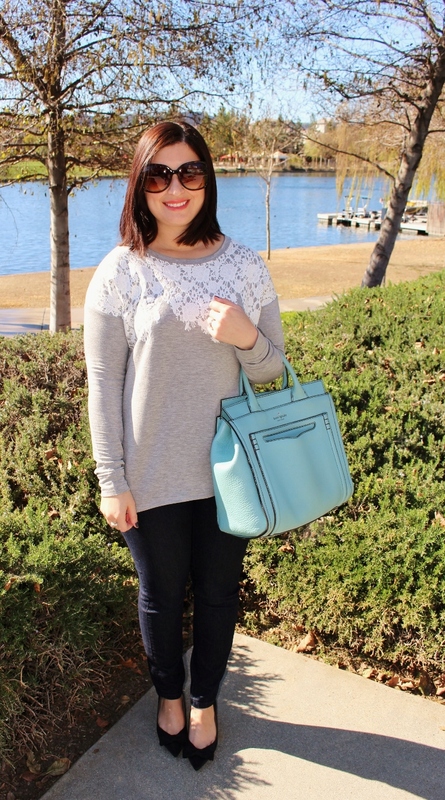 We all need a comfy, simple, go-to look! I LOL'd at your comment about him never touching your laundry again! I'm soo soo soo the same way! The dryer terrifies me for clothes I actually care about! I love the sweater - so effortless but still interesting! And I also love your hair at all lengths. I know that's not helpful - I would love to see it longer again, but I would not be at all offended if you kept it shorter! I'm jealous that your face shape lends itself to all lengths! I really love all the lace detailed and embellished sweatshirts - I don't usually like wearing sweatshirts but when they have these feminine touches, who could resist? Also, I cut my hair recently (nothing too dramatic, still touches my shoulders) but it really does make you re-think how you style it - curling hair is so different now that it's shorter! I really love a longer bob right now! Emma has kind of proven that you can do sooooooooo much with that length!